I’m ill today (currently accepting all the pity), and blogging from the couch, where I’m sitting with a hot cup of tea and binging Netflix. In fact, I’m binging an old show that is the equivalent of comfort food. Look, this show is absolutely the goofiest thing you’ll ever watch. It’s also genuinely funny, dramatic, tear-jerking, and eye-rolling. In short, it’s that peculiar mix of drama and whimsy that the BBC excels at producing. It’s very much part of the British sensibility, I think, this mix of whimsy and drama… and terrible CGI. There’s just something about that mix, and the peculiarly Britishnes of the whole thing that is somehow a killing combination. 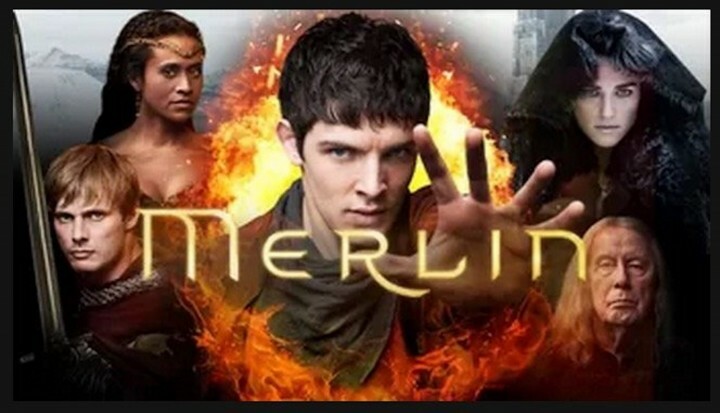 Since I’m watching it anyway, I figured I chat about the show, and how it both adheres to and breaks some of my favourite fantasy tropes. 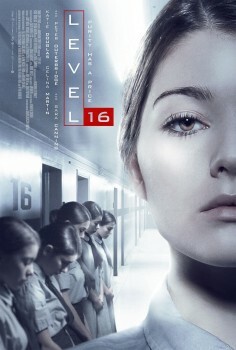 Last week, I headed out to the Mayfair Theatre in Ottawa (Canada) for a screening of the film Level 16. An aside, the Mayfair is a quaint little theater that has been in operation since 1932. The interior doesn’t seem to have been changed since it’s early days, and the in-house film graphics haven’t changed since the 70’s, I’m certain. Anyway, I figured I could turn the visit into a film review. For true transparency’s sake, I have to state that my flatmate and good friend worked on this film. I guarantee you, though, that I’m being as impartial as I can about it. This is a female-led production; a female writer and director (Danishka Esterhazy) with female leads, Vivien and Sophia, brilliantly portrayed by Katie Douglas and Celina Martin respectively. Well, maybe things rarely get that extreme. But sometimes, one kind of reality actually does impinge upon the other kind, and you experience a moment in your waking life that has come straight out of a celluloid Hollywood dream. Let me tell you what I mean. John Huston’s 1941 film The Maltese Falcon is one of my favorite movies. It may be blasphemous to say so, but in some ways I consider it superior to Dashiell Hammett’s brilliant novel, as Huston’s screenplay wisely omits the book’s only misstep, a bizarre dead-end subplot involving, of all things, the Fat Man’s daughter. Back in those long-gone days when the advent of the VCR suddenly freed us forever from the tyranny of station scheduling (days I look back on with nostalgia, now), The Maltese Falcon was the first videocassette I bought, the first movie I had to own. I can’t even begin to estimate how many times over the years I’ve seen it. I sometimes get overwhelmed by all the things on Netflix that I don’t want to watch, and yet, when I’m alone, I like to watch a bit of TV while eating. So lately I’ve been pulling out some old 1970s sci-fi. I watched a few episodes of my Battlestar Galactica boxed set. And surprisingly, I’ve been enjoying Logan’s Run the TV series. And it’s made me think about the way the 1970s TV sci-fi aesthetic stuck together. It’s more than just the computers that all look the same. The brightly-lit panels on everything ring futuristic to me, perhaps because I lived through the tail end of the 70s with an impressionable aesthetic palate. 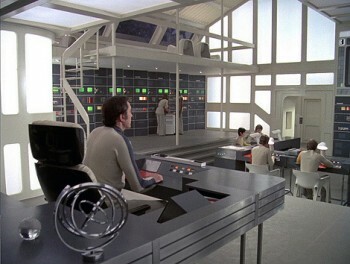 I’m curious — do you guys think that there’s a 1970s sci-fi TV “look and feel”? So in celebration of nature’s renewal, here’s a double-dose of goth stuff. The first item up gets credited to Fandango who did a fabulous job getting us ready for all the 2019 reasons to hold tight to your date in a darkened theater. Feast your eyes on an awesome mashup of upcoming horror movie trailers. Us is in theaters now, and Pet Sematary, which is already getting early raves, opens this weekend but everything else is down range. 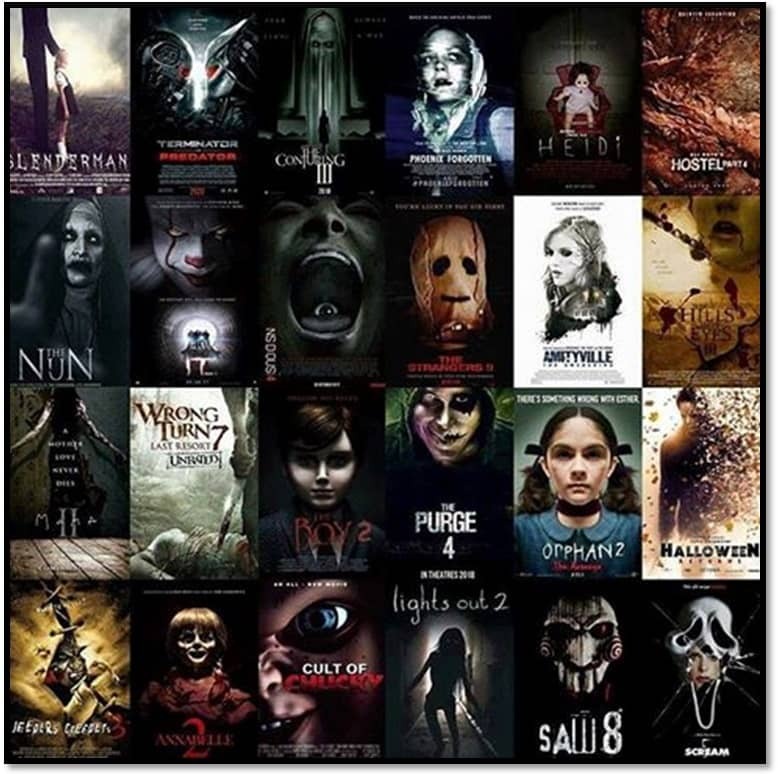 Previews includes sneak peeks at flicks such as Child’s Play, Scary Stories to Tell in the Dark, BrightBurn, Hellboy and The Curse of La Llorona to name a few. The ABC Movie of the Week (a beloved American institution on a par with Turtle Wax, disputed Florida elections, and SPAM, and whose history I detailed here) was, during its six season run from 1969 to 1975, a veritable goldmine of cheesy science fiction, mystery, and horror stories… only there were some MOW’s (for you members of the Netflix generation, that’s the acronym for movie of the week) that were a bit better than cheesy, and a rare handful were even better than that — that were, in fact, damned good. At the pinnacle of this admittedly rather small mountain stands The Night Stalker, which chomped its way into millions of unsuspecting living rooms on the evening of January 11th, 1972. 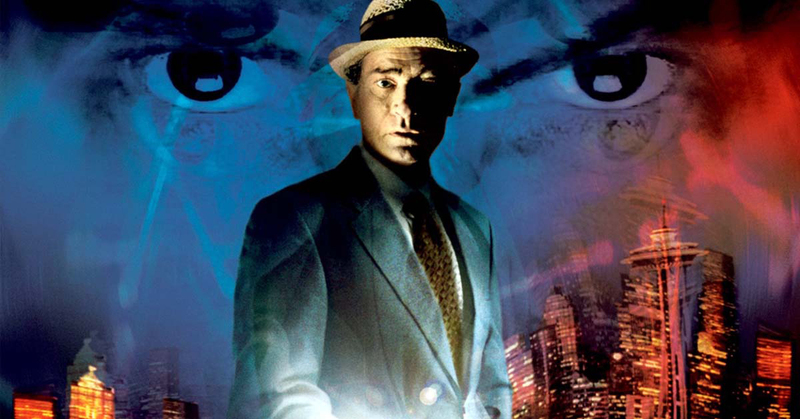 The Night Stalker is the story of a serial killer on the rampage in Las Vegas, except that at the time, the term “serial killer” had yet to be coined by FBI agent and profiler Robert Ressler; he came up with it a full two years later. That’s how long ago 1972 was. One of the most fascinating crosses for me is when science fiction and religious faith hang out. Star Wars is deeper for the faith of the Jedi. Worlds like Altered Carbon are starker and more desolate with their utter materialism. One of my favorite mixes of science fiction and religion is Battlestar Galactica, both the original series with its angels, and the 2003 reimagining with its robotic religious zealots. I hadn’t watched Battlestar Galactica in about half a dozen years, but as I make my way through the project of trying to watch some of the top drama on TV, I wasn’t surprised to find Battlestar Galactica on a New York Times list of top 20 dramas since the Sopranos and I decided to watch it again. Three years ago, I primal-screamed at Showtime for not only ending one of my favorite binge series, Penny Dreadful, but for how they ended it. I won’t put any spoilers here in case you haven’t had the pleasure since I still highly recommend it – all the way up until the last episode. If you have seen it then you know showrunners left the door open just a smidge to allow for the series to possibly pick up where it left off. 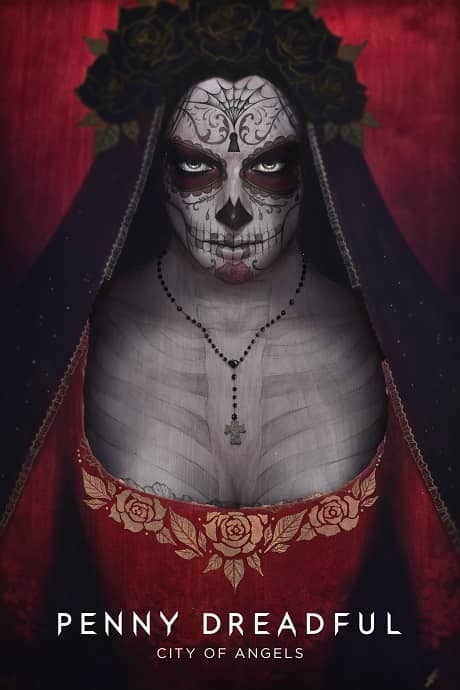 And now the news is out that Penny Dreadful is indeed coming back, but in an entirely new iteration entitled Penny Dreadful: City of Angels. First a little background. If you weren’t aware, “penny dreadfuls” were first produced in Britain in the 1830’s and referred to a serial story published in weekly parts, each costing a penny. The content was usually something shocking by Victorian standards, involving characters such as Varney the Vampire and Sweeny Todd and touched on crime or the supernatural. The Showtime series riffed on the same, artfully bringing together a litany of monsters into one storyline. Penny Dreadful showcased Dr. Frankenstein, his creature, his bride, Dorian Gray, vampires, witches and werewolves, to name a few, all set against a backdrop of 1830’s London. Penny Dreadful: City of Angels is set to begin production “soon,” and creator John Logan describe it as a “spiritual descendant” of the original. As you would guess from the title, the new iteration takes place in Los Angeles and will once again deal with the conflicts between the forces of good and evil – both human and supernatural. Some people, 24 (or 25?) movies in, are expressing MCU superhero movie fatigue. (Certainly not me or most of my friends — the films continue to be some of the more fun, thrilling entertainments to be had at the cineplex two or three times a year. Is the quality dropping off? Hell no — try to rank ‘em; I’ll bet several of the ones at the top of the list came out just in the last couple years.) I’m talking about a few critics (some of whom were saying the genre was getting “tired” and “played out” 15 films ago), and a few newcomers who didn’t grow up on four-color comics but jumped on the bandwagon when the culture went crazy for costumed crime-fighters. 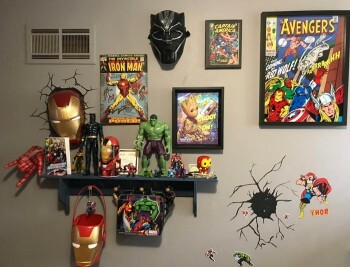 I can imagine how it must look to them: Now they turn on their TV and it seems like a dozen streaming and broadcast tv shows are about caped crusaders; they check the movie listings and half the films filling up theater screens are about super-powered beings. They suggest it will eventually play out. They think audiences will finally be sated, the fad will pass. Everyone will grow tired of beautiful people in spandex. 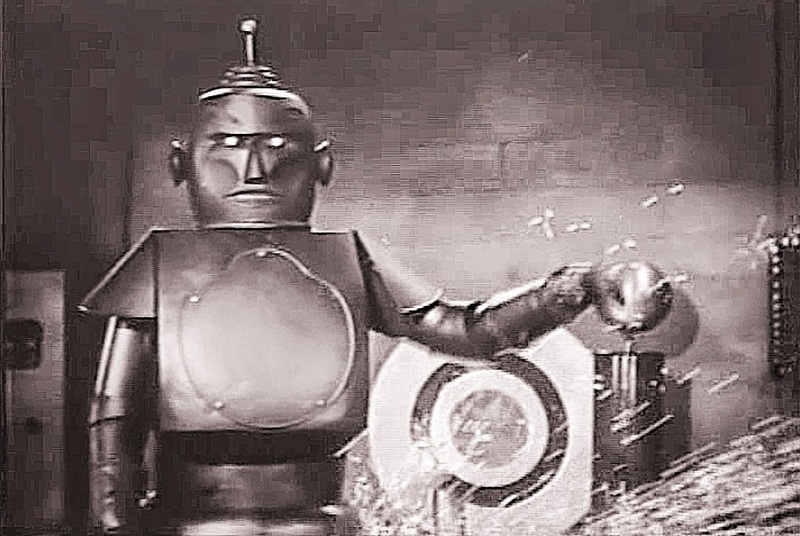 A true oddity in the history of robots is the complete absence of robot films in American cinema before the 1950s. By my count studios made exactly zero full-length feature films with a major robot character. Not even Universal, at its twin peaks of fabulously successful and highly profitable monster movies in the 1930s and 1940s, thought to include a robot hero, antihero, or villain. Would-be robot historians have to cheat mightily to drag a robot into their texts. For unknown reasons they credit Universal’s low-budget Man-Made Monster as a robot film. The title monster is a circus freak who can absorb electricity. Feeding him with ever-greater amounts of volts turns him into a mind-controlled, rampaging but still-human monster. The Wonderful Wizard of Oz is a favorite because of the Tin Man. The Tim Man – Nick Chopper as he would be named in a later Oz book – has a metal body but retains his human (or Ozian) personality. He’s a cyborg, not a robot. His greatest wish is for a heart, to make him even more human. (Baum created a true mechanical man, Tik-Tok, but just try finding him in a movie.) 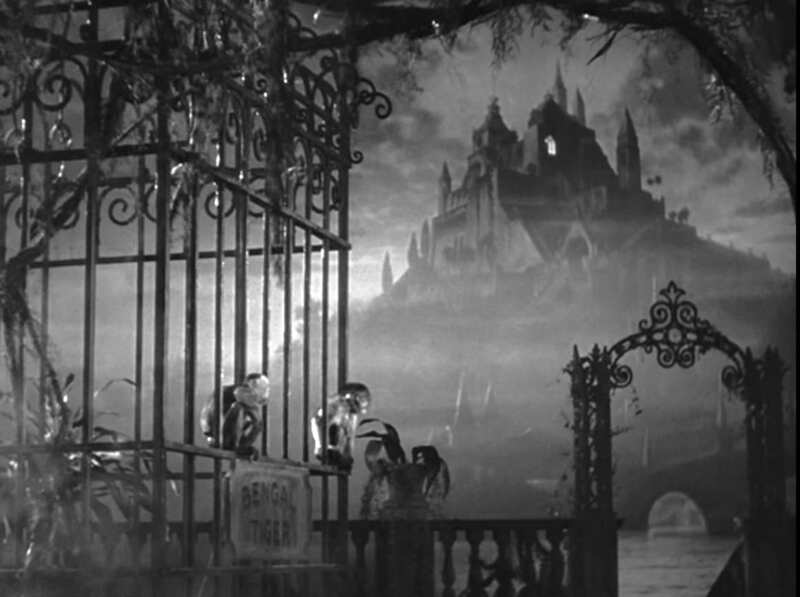 You might even see a mention of Basil Rathbone’s Fingers at the Window, whose newspaper ads scream “Mystery of the Robot Murders,” but whose monsters are hypnotized humans. Therefore, even in an era we fondly remember for its pure cheeziness, robots are low-grade Gheeze Whiz. To find any, cinemaphiles need to descend to the bottom of the Hollywood pecking order, the serials.